John Hume, MP, MEP, Nobel Laureate, has spent his life in the relentless pursuit of a peaceful solution to the conflict in Northern Ireland. Mr Hume was born in 1937 in Londonderry, Northern Ireland. Formerly a teacher, Mr Hume came to prominence through the civil rights movement in the 1960′s when Catholics demanded substantial changes to the way Northern Ireland was run. He helped to found the moderate nationalist Social Democratic and Labour Party in 1970, later taking over as its leader from Gerry Fitt in 1979. He became a member of the European Parliament that same year. He has been one of the driving figures behind many of the significant attempts to resolve the Northern Ireland problem over the past 35 years. He was instrumental in bringing Sinn Fein into the political fold, determinedly carrying on talks with Gerry Adams for years despite unionist and British government criticisms. The talks with Adams led to IRA cease-fire in August 1994. Mr. Hume strongly supported the view that any talks about the future of Northern Ireland should be as inclusive as possible. When a deal was agreed to on Good Friday in 1998, the participants included Sinn Fein as well as political representatives of the Protestant paramilitaries. He went to campaign vigorously for a yes vote in the referendum, symbolically sharing a stage with David Trimble (Ulster unionist leader) and Bono of U2 in an effort to swing the unionist vote. Mr Hume’s relentless opposition to violence and his tireless pursuit of the path of peace in Northern Ireland has won him a plethora of awards including numerous honorary doctorates from 44 different universities. In 1998 he was awarded the Nobel Peace Prize jointly with Ulster unionist leader David Trimble in recognition of his untiring efforts to find a peaceful solution to the conflict in Northern Ireland. Mr Hume continues to work for peace in Northern Ireland. Dr. Margaret Kunstler-Humphrey spent her life in pursuit of excellence in medicine and the continual promotion of human rights and peace both in Canada and internationally. She married Professor John Peters Humphrey in 1981 and actively supported him in his life-long endeavor to entrench the Universal Declaration of Human Rights, continuing his work in the field of human rights after Professor Humphrey passed away in 1995. Dr. Kunstler was also a powerful activist in her own right. Born in Leipzig, Germany in 1908, she completed her medical studies at Heidelberg, Berlin and Leipzig. After receiving her medical degree from the University of Leipzig in 1932, she went on to the the University of Padua, Italy in 1933 where she received a second medical degree. From 1933-1938 she worked as a physician in Rome at the Ospetale del Bambin Jesu, completing a specialist degree in pediatrics during this time. She immigrated to Canada in 1939, obtaining her Canadian medical accreditation in 1940. Between 1942-1988, she was a member of the medical staff at the Royal Edward Laurentian Hospital for Chest Diseases (later renamed the Montreal Chest Hospital), receiving a specialist diploma in respirology. She resigned from the hospital in her 90th year. Dr Kunstler holds numerous recognitions from the Government of Canada, the Government of Nova Scotia and the Soka Gakkei University. Archbishop Emeritus Desmond Mpilo Tutu of South Africa has lived an outstanding life as a spiritual church leader and a peace and human rights activist. Â Archbishop Tutu was born in Klerksdorp, South Africa in 1931, the son of a school teacher and domestic worker. He entered the ministry in 1958, receiving his Licentiate in Theology and was ordained to the priesthood in Johannesburg in 1961. Shortly afterwards, he obtained a Bachelor of Divinity (Honors) and a Master of Theology in London, returning to South Africa in 1967, joining the Federal Theological Seminary in Alice and becoming Chaplain at the University of Fort Hare. He became Dean of St Mary Cathedral, Johannesburg, in 1975 and shortly thereafter he was elected Bishop of Lesotho. in 1978, Archbishop Tutu became the General Secretary of the South African Council of Churches (SAAC) in 1978. During his tenure as General Secretary SAAC (1978-1988), Archbishop Tutu became an international figure for speaking out against the injustice of apartheid. He called for economic sanctions against the white government and became a lead figure in the campaign to bring racial justice to South Africa. In 1984 he received the highest award the world offers, the Nobel Peace Prize, in recognition of his leadership in the non-violent struggle for liberation from apartheid. 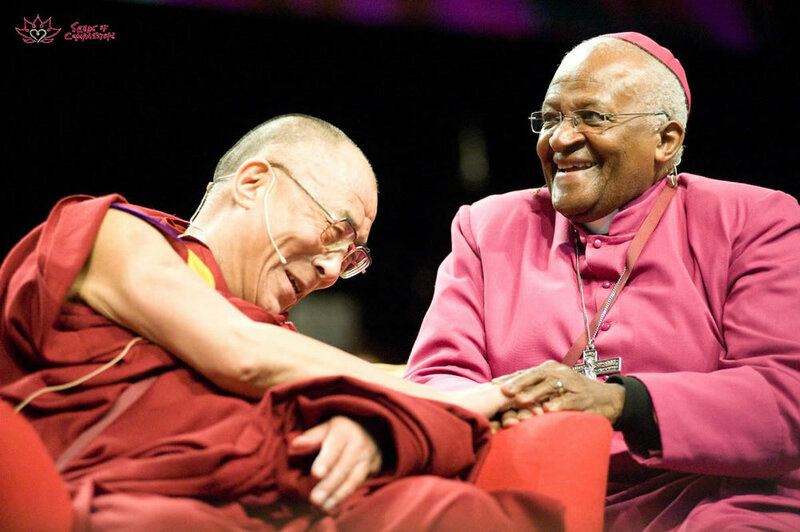 In 1985 Bishop Tutu was elected Bishop of Johannesburg and in 1986 was elected the Archbishop of Cape Town. With the release of Nelson Mandela and the unbarring of the African National Congress and other political organizations in 1990, Archbishop Tutu became a principal mediator and conciliator in the difficult period of South African history leading to the first democratic elections in 1994. Afterwards, President Mandela appointed Archbishop Tutu as the head of the Truth and Reconciliation Commission, the body charged to deal with the legacy of human rights violations during the apartheid period. He retired from office as Archbishop of Cape Town in June 1996 and was named Archbishop Emeritus, July 1996. He continues to shape South African society, unafraid to criticize the new government and remains an outspoken advocate for social justice, freedom and equality in South Africa and around the world. The Right Honourable Antonio Lamer PC, carries with him the rich experience of a distinguished career bridging the varied sectors of the Canadian legal world. Chief Justice Lamer was born in Montreal, Quebec in 1933, the son of Antonio Sr (lawyer and CQ) and Florence Storey. He studied at College St Laurent in Montreal, graduating in 1952 and went on to earn his civil law LL.L at the Universite de Montreal in 1956. Called to the Bar of Quebec in 1957, he founded the Association of Defence Attorneys of the Province of Quebec and was the National Chairman of the Criminal Justice Section of the Canadian Bar Association. He became a partner with Cutler, Lamer, Bellemare et Associes. He also lectured at thh Universite de Montreal in criminology. He also served as President of the Montreal District of Young Liberals in 1960, then as Secretary from 1961-1966. In 1969 he accepted his first judicial appointment as a judge of the Superior Court and the Queen’s Bench (Crown Side) of the Province of Quebec. He has also been deeply involved in Canadian law reform, first as Vice-Chairman of the Law Reform Commission of Canada from 1971-1975 and subsequently as Chairman of this Commission until 1978. In 1978, Chief Justice Lamer was appointed to the Quebec Court of Appeal and, two years later, on March 28, 1980, he became the 57th Puisne Justice to the Supreme Court of Canada. He was concurrently a member of the Privy Council of Canada and Deputy Governor-General of Canada. He retired as Chief Justice of Canada and of the Supreme Court of Canada in January 2000.